This gem of a recipe takes just a few minutes to make and has a real wow factor. It has no refined sugar and is a healthy and fun way to get fruit into kids. Place the frozen raspberries in a food processor or blender and blitz briefly until chopped into small pieces. Remove 50g of the raspberries, place in a food bag and put in the freezer for serving or even as healthy sprinkles on other dishes. Add the yogurt and honey to the remaining raspberries and blitz until really smooth, scraping down the sides if necessary. Only blend the mixture for the minimum time possible, as the longer it gets blended, the softer it will become. It should have a soft ice cream or frozen yogurt consistency and can be served like this. However, for a firmer finish, transfer to a plastic container, cover and freeze for at least 1 hour. 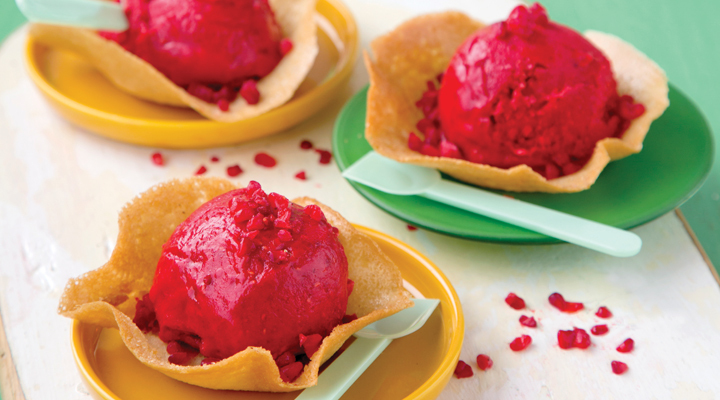 Scoop into six balls and serve one in each tuile basket, cone or small bowl. Sprinkle the reserved raspberry pieces over and serve.